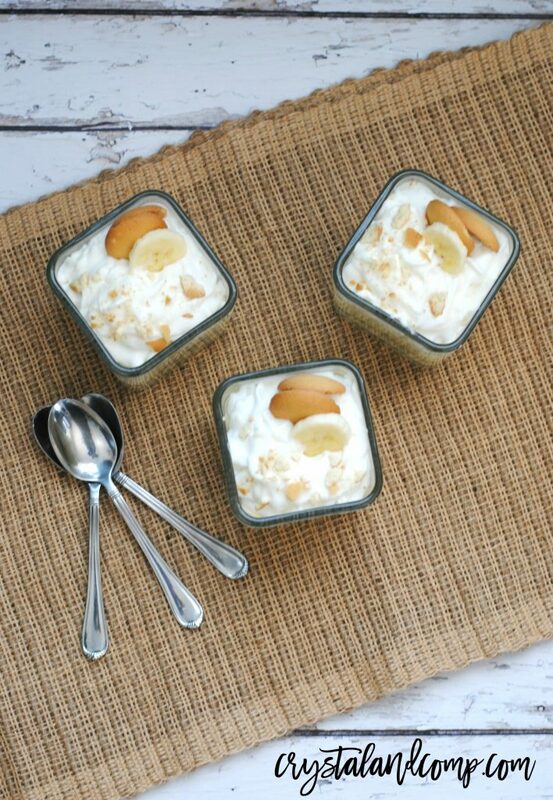 Banana pudding is one of our family favorites. It perfect for any time of the year. 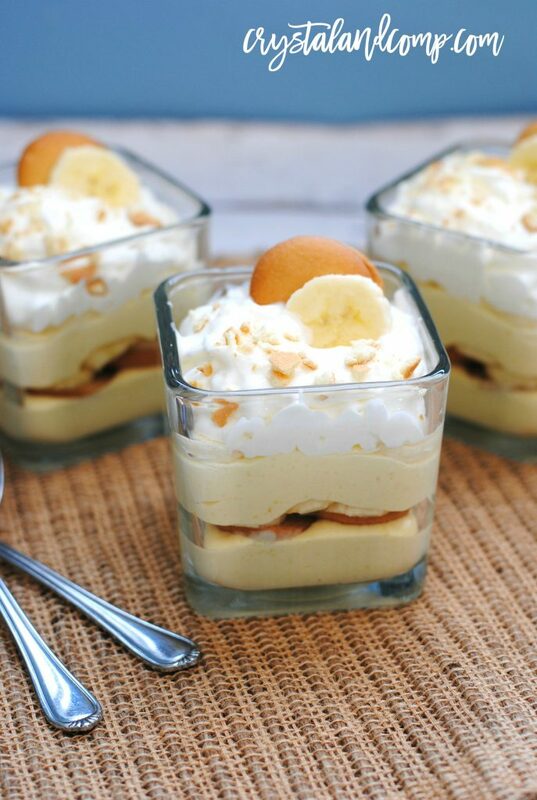 This layered banana pudding recipe is a crowd pleaser for sure. I love this recipe and I think you will too! Every time we have an event at church back in Dallas, everyone requests one of our sweet ladies, Ms. Linda, make her famous banana pudding recipe. There was a point in time when she auctioned off a recipe a month for an entire year at church. We won that and it was one of the best treats you could ever imagine. We picked a different recipe each month. Her banana pudding was at the top of the list! Let me show you just how easy it is to make…. she did share the recipe with me. Here is everything you will need to make this classic recipe and it will serve 8 to 10 people, easy. This recipe does not include egg whites. 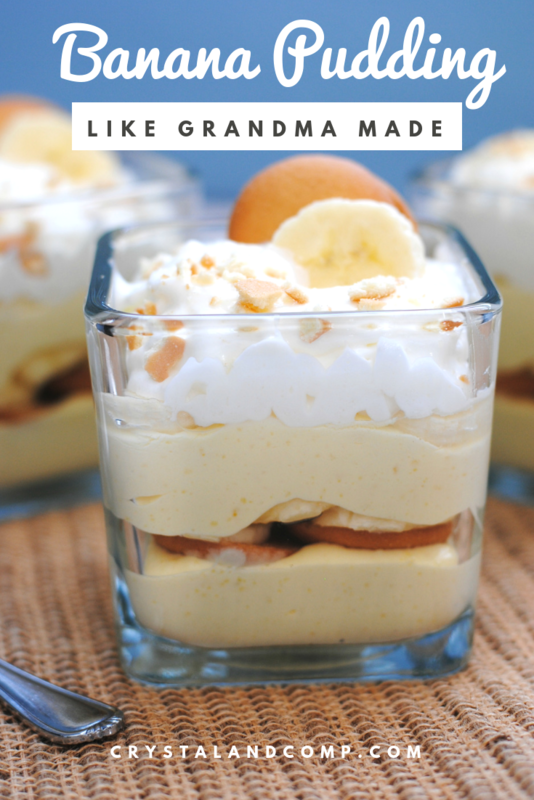 I know some banana pudding recipes do, but this one does not. We made this up in individual cups, but we share options with you below for other ways you can serve it. Beat milk and instant pudding until it is well mixed. Add sweetened condensed milk, Combine it well. Fold in about 12 ounces of Cool Whip. You’re going to layer the ingredients starting with the pudding mixture to cover the bottom. Then, the vanilla wafers, and some banana slices. Repeat until out of ingredients. If you don’t want to make individual banana pudding cups like we did, you can use a large baking dish and follow the same layering process. This is the ideal way t make it if you’re taking this to a pot luck or family gathering. Garnish with cookie, banana slices and whipped cream on top of the pudding. This is perfect for any family gathering you have any time of year. Perfect for the holidays and potlucks. It will sell like hotcakes at your bake sale at church. Or, make it just because. Our family could eat this every single night for dessert. It’s like southern comfort food at it’s best. 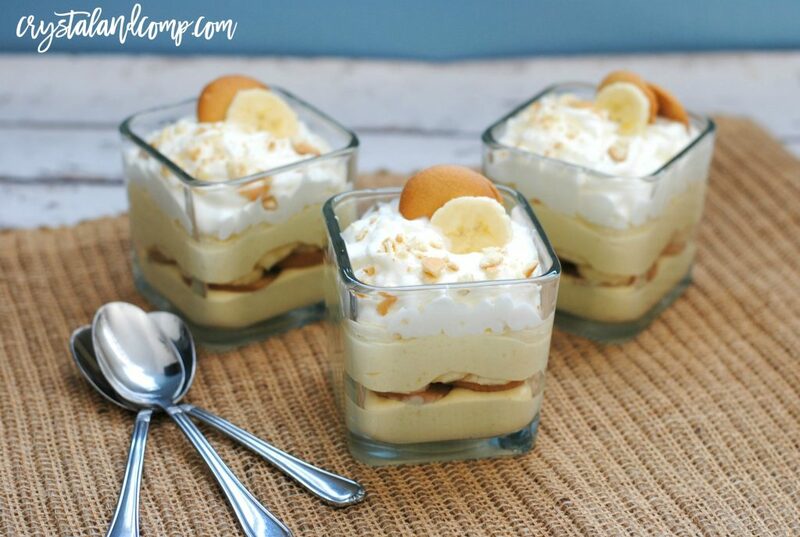 My family loves banana pudding… this recipe is their favorite! Looking for more banana recipes? I think you will love our no bake blueberry banana pie. My mom has made it for years. It’s amazing! This looks so good I want to just reach in and grab one right now!! I LOVE banana pudding!! I can’t wait to try your recipe this weekend for Easter! Wow, what a delicious and super easy recipe. Banana is my favorite and this is a great recipe. Thank you for sharing! I love it! I absolutely love this treat and may need to make it today! It’s been a long time since I’ve had it! Yum!